Anticlea elegans (Mountain Death Camas) | Plants of the Northeastern U.S.
Synonymous with Zigadenus elegans Pursh. Quebec to NY, west across northern U.S. and adjacent Canada to the cordilleran region from AK to northern Mexico; disjunct in the southern Appalachian region from VA to NC and in the Ozarks of MO and AR. Herbaceous perennial from a tunicated bulb; stems erect 20-60 cm; leaves glaucous, especially when young, mostly crowded toward the base, linear, 20-40 cm, up to 1.2 cm wide; inflorescence 10-30 cm, paniculate (rarely merely racemose), the branches subtended by large, lance-ovate bracts; bracts usually suffused with purple and marcescent at anthesis; tepals 7-12 mm, oblong-obovate, rounded-obtuse, adnate at the base to the base of the ovary, white or greenish-yellow, usually strongly suffused with purple or brown toward the base abaxially, and with a dark obcordate gland just below the middle adaxially; fruit ovoid, 1-1.5 cm; seeds angular, 3 mm. 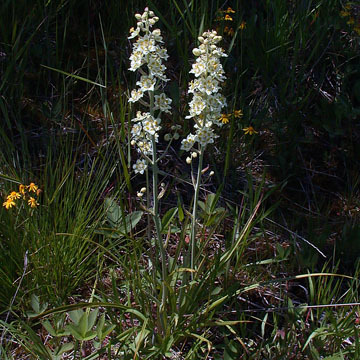 Typical A. elegans is mostly western, with more yellow flowers, less glaucous herbage, and the inflorescence often merely racemose. The plants shown and described here are var. glaucus (Nutt.) Zomlefer & Judd.